Includes: Two hand–off–auto switches, two pump run lights, alternator circuit and terminal blocks for external wiring connections. 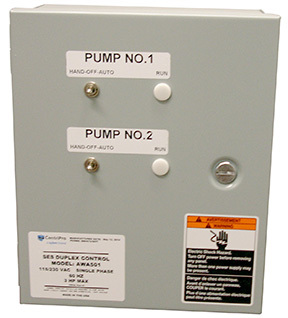 Duplex alternator panel may be used to alternate two submersible or centrifugal pumps. Alternate two pumps and start the second pump in the event the first pump cannot meet the system demand. Auxiliary contacts allow the operation of one or two chemical feed pumps, such as chlorine or ozone injectors. To build and operate an efficient water system, you need both the right products and experts who know the application. CentriPro motors, repair parts and accessories are specially designed to work with your Bell & Gossett, Goulds Water Technology, Red Jacket and Marlow Pumps products. Yes! Add me to your mailing list for info about future product launches.